Here ya go, installment number two of our series on “Things To Do With Your Children This Summer”. Fun things the kids will enjoy & cool them down as well. This weeks ideas involves water in all it’s forms. 1. Glow stick swimming: Whatever kind of swimming pool you have, just buy some glow sticks and drop them into your pool. This is great nighttime swimming fun! 2. 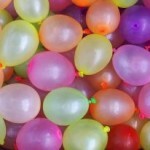 Water Balloon Pinata’s: Fill an ice chest full of water balloons and have a blast. In some of the balloons you will put inexpensive prizes. Kids take turns at bat as they choose a balloon out of the cooler and toss and swing!A different surprise inside each time makes this great fun! 3. Water Balloon Baseball Practice: While you are filling up water balloons for the Pinata fun , fill a bunch for some good old batting practice. Roll out a slip and slide , and let them practice sliding into base as well. It wouldn’t be a baseball practice without a game of catch , so let them practice throwing and catching those water balloons as well. 4. The Water Blob: This looks like a Giant water bed in the back yard. Our finished size was 9’x12′. All you need is two sheets of 4mm thick plastic sheeting and duct tape. Fold the plastic sheeting in half and tape the three open sides with duct tape but leave open a small hole for the water hose. Add some bright blue food coloring if you choose. Put the water hose in it and let it fill.When it’s totally full, tape the small opening shut.The wee one’s and you will have hours of fun jumping, slipping and sliding! 5. Homemade sprinkler fun: Toss the garden hose over a branch, take a empty liter soda bottle and poke holes all around the bottom sides. 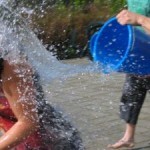 Attach it to the hose, great way for kids to cool off in the summer sun! 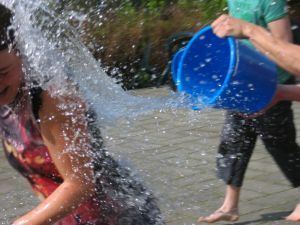 6.Good Old Fashioned Water Fight! 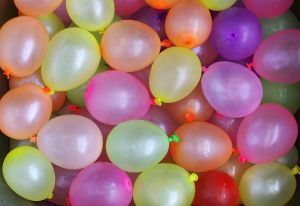 : Grab the buckets, squirt guns, sponges and garden hoses and prepare to get wet! Sometimes it’s the simple things in life that bring the most joy and create the best memories.